My last post was about legendary pixel art logos of the PC and Commodore Amiga scenes and the collection with over 25 sets of logo images that I created at my Flickr.com account to share them with everybody who is also interested in this stuff. I did now also uploaded my collection of scene pixel art font sets to Flickr.com. I created a special collection for the font set images, which includes today 8 different sets with over 500 font sets overall. I have a bunch more, but in raw format or sliced up with individual images for each character and not the appropriate format to upload and share on a social media web site like Flickr.com. The fonts were pixeled by hand, just like the logos were. Many of them on the Commodore Amiga with image editing tools like Deluxe Paint and others on the IBM PC with MS DOS, using tools like the PC adaptation of Deluxe Paint (Deluxe Paint 2 enhanced or Deluxe Paint Animation), Autodesk Animator Pro or similar tools (you can find download links to the mentioned MS DOS editors at my download page). No Adobe Photoshop or similar modern day editors were used by the artist. Everything had to be done manually. VGA art was painstaking work back in those days and required more fundamental skills of design and visual perception and lighting than you need today, where some stuff is done automatically by the tool (e.g. anti-aliasing) or you have a filter plug-in that does the desired effect for you. Those editors also had no “undo” or “history” features. “Undo” was more like a “re-do“, at least for everything that you did since you created a backup copy of the image you are working on and not overwrote with newer versions since then. Unlike most fonts used today on the computer, which are commonly True Type fonts, which is a vector format allowing the fonts to be scalable and remain smooth regardless of the size you choose, pixel fonts are fixed size and cannot be scaled. They are basically an image. You can create pixel or bitmap fonts for the use on a Windows PC or Macintosh, if you have the right tools (here is a tutorial how to do that),?? but that is not the type of font that you will find in my collection. The fonts in my collection were never meant to be used as a font in an operating system by different applications, such as Word processors or image editing programs. Those fonts were usually designed for a specific purpose that was known to the artist before he even started to create one. That purpose was typically a “demo” or “Intro” project, or maybe a computer game development project. The programmer had to “slice up” the image with the font characters in it and then use the individual slices that represent a character in his code to do something with it, such as creating a text scroller or apply some other fancy effects to have text messages appear into on the screen or to make them disappear. Those effects range from simple faders, over zoomers to elaborate effects where the letters are twisted and bent and rotated or combination of all or multiple of the mentioned ones. Here is an example of a font, which also includes maker lines that were added by the artist to make it easier for the coder/programmer to “slice-up” the font and get the individual characters out of the image. Although I was known as an ANSI and ASCII text artist in the “scene” back in those days, I also did some pixel art work. I did not do very much, because I was never more than average doing it. I realized that it is better to stick to what you are best at and leave the pixel stuff to the guys that are really good doing it, such as the former SAC member and personal friend “Dream Design“, who was capable of creating astonishing pieces of art within the limitations of colors available to use and screen resolution. 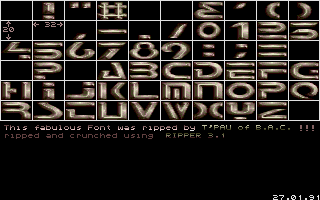 I created 13 pixel art fonts, mostly for some cracktros SAC created for some other release groups. I created a separate set for those fonts at Flickr.com. I did not do that to highlight them and to show how great I am (or was), I separated them, because the legal situation for if and how you could or could not use those fonts today is not clear for the other ones that I did not create myself. Nobody was thinking about Copyright when they created those things. There was also no commercial intention for its use, it was about reputation and getting known and recognized… “fame” basically. In order to do that as good as possible, you not only wanted that your stuff was spreading as far and as fast across the globe as possible, no, you even helped?? yourself with spreading as good as you could, or your fellow group mates, some even doing nothing else than “spreading” or “trading” your work, because that was their position and job within the group. The problem is that because nobody specified in writing if and how the work that you created can be used by others, full copyright protection supposedly is applied by default, meaning that you cannot do anything with it, without the explicit permission of the artist, who is often unknown or only known by his pseudonym or scene handle, thus virtually impossible to contact and ask. I made the decision for my art to give up the rights on them and made all of it available to anybody to use as he likes, except to create copyright protected derivatives of it. I basically want to make sure that my stuff stays free, even if you take it and add something of your own to it. 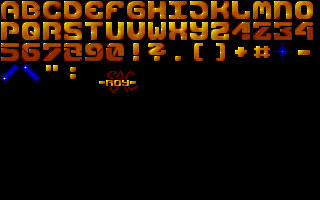 Here is the most elaborate font that I ever pixeled. It is very large, or better was large at the time when I created it, because you have to keep in mind that the screen resolution for fancy VGA stuff on the PC was only 320×200 pixels and 256 colors. The font looks small today, at least on my screen, where the resolution is 4.5 times as high as the resolution the font was intended for. It took me over 5 hours to pixel and was used for a Crack Intro for the PC games release group “Genesis” where I was a member of at the time. I cannot show you the cracktro unfortunately, because I am unable to get it to run and capture (video) on my PC today, even with a MS DOS emulator like DOSBox. I am still trying to find a way to get a capture of it. You can download it here (only 55 KB) and send me a video capture of it, if you get it to work. It can also be without the sound, which I have and can add later. I only need the video images. I hope you liked my little excursion back in time and also the font sets that I made available for you on Flickr.com.